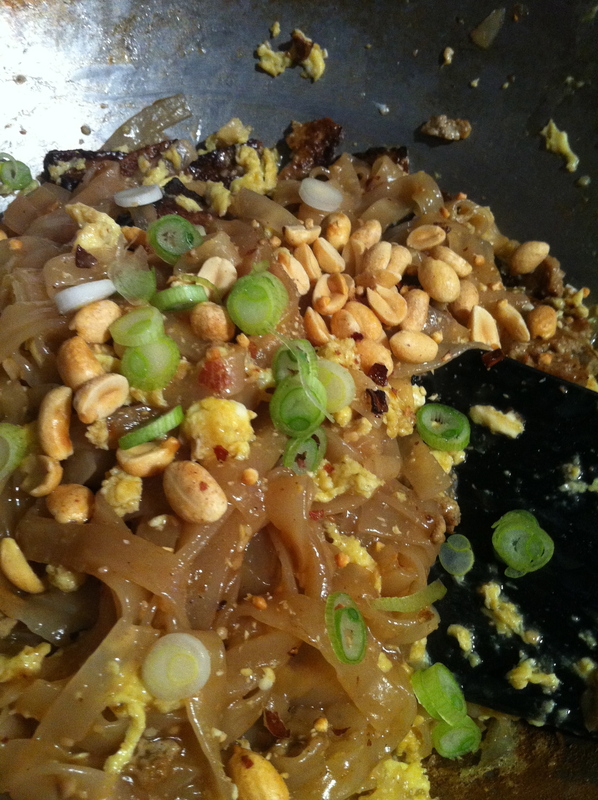 I was feeling stressed…so of course I decided to make something complicated like Pad Thai. I’ve made this a few times before, but I was obviously distracted…so I burnt the shallots and the noodles were, well, in a word, GROSS. And did I mention that I decided to sub in BLACK Tofu for the chicken? I’d never even heard of Black Tofu before I saw it at the grocery store. I looked it up online – yay Google! – and settled on marinating it in a combo of sauces and then roasting it. THAT was delicious. Next time I’ll write down the combo and measurements… Anyway, I subbed in the roasted and delicious tofu for the standard chicken in my Pad Thai. And the noodles got all blech. I ended up picking all the tofu outta the pan and throwing everything else away. End Result? I’m gonna tell you about the WONDERFUL meal I made MONDAY night for dinner. They seriously seriously rock. If you haven’t already picked up one of their cookbooks or subscribed to one of their cooking magazines, well, you NEED to. This cookbook is FABULOUS. So far I’ve made three recipes out of it. A few weekends ago I made the General Tso’s Chicken – SOOOO GOOOD! And then I tried my hand at Fish Meunière (lightly fried fish in a lemon-caper sauce), Twice Baked Potatoes and Roasted Broccoli. I was thinking about using the Roasted Broccoli with Cheese Sauce recipe, but opted to serve the veg sans cheese. C, J and I love love loved the meal! R? She thought smearing yogurt on everything she could touch was a better option. Roasting makes everything taste better! 2- Wash and cut your broccoli into florets. Lay them out on a baking tray. Shpritz or drizzle with your spray or oil. 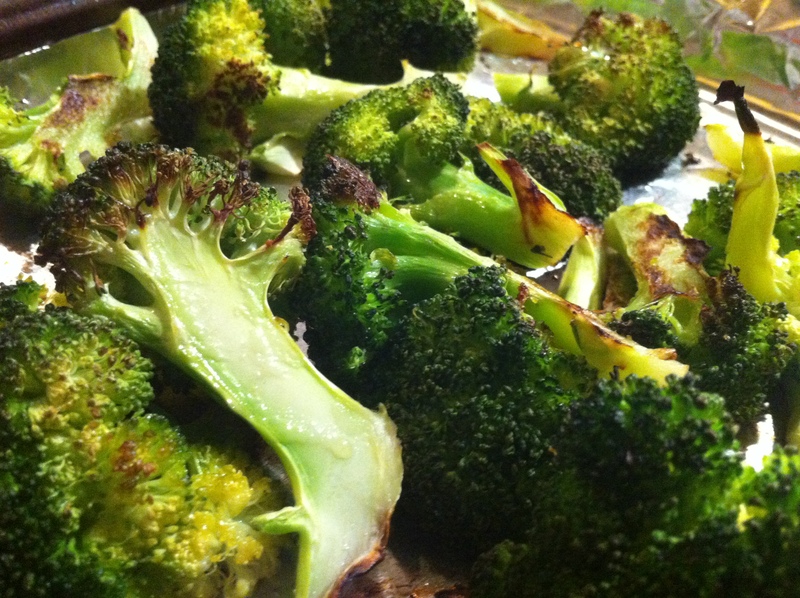 3- Whack the baking sheet in the oven for about 15 minutes – until the broccoli is all brown and crunchy and delicious smelling. Season with salt and pepper when you take the pan outta the oven. Applaud and then hand a stem to your awaiting toddlers. 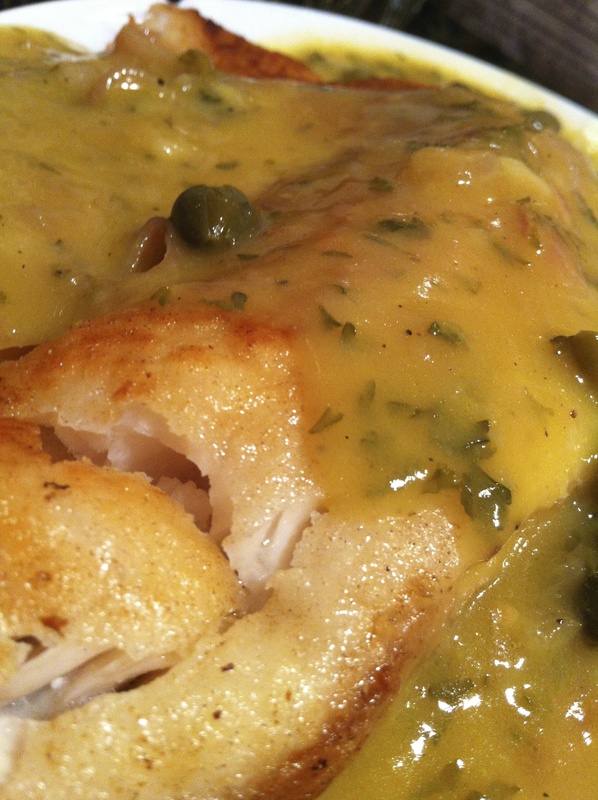 Simple Sauce and DELICIOUS fish! 1 cup Low-Sodium Chicken Broth **I subbed in No-Chicken Chicken Broth. 1 Tablespoon Unsalted Butter, softened **I squished it gently in my hands to soften it. 1 Tablespoon Capers, rinsed **I doubled. 1 Tablespoon Fresh Parsley, minced. **Sigh. I forgot to pick some up. I used dried. 1 Tablespoon Lemon Juice **C and I thought it needed more, so I ended up squeezing the entire lemon instead of only the intended half. 8 (3-oz) Skinless Fish Fillets 1/4-1/2″ thick **I used 4 large Tilapia fillets. 1- Combine 1 teaspoon oil and shallot in saucepan, cover and cook over medium-low heat until softened, about 4 minutes. Stir in wine, increase heat to medium-high, and simmer until pan is almost dry, about 2 minutes. Stir in chicken broth, simmer for 2 minutes. Mash 1 Tablespoon flour into softened butter in bowl to form paste, then whisk into pan; simmer until sauce is thickened, about 2 minutes. Stir in capers, parsley, and lemon juice, season with salt and pepper to taste, cover, and set aside. **I poured my sauce into a bowl so I could reuse my skillet. 2- Pat fish fillets dry with paper towels, season with salt and pepper, and let sit until glistening with moisture, about 5 minutes. If using tail-end fillets, score and tuck tail underneath fillet. Spread remaining 1/3 cup of flour into shallow dish. Lightly dredge fillets in flour, keeping any tail pieces tucked. 3- Heat 1 tablespoon oil in 12″ nonstick skillet over high heat until shimmering. Lay half of fillets in pan, reduce heat to medium-high, and cook until golden on bottom, 2 to 3 minutes. Using spatula, gently flip fillets over and continue to cook until fish flakes apart when gently prodded with paring knife, 30 – 6o seconds; transfer to platter and tent loosely with foil. Repeat with remaining 1 Tablespoon oil and remaining fillets. Transfer fish to individual plates, leaving accumulated juices behind on platter. Spoon sauce over top and serve! 1 teaspoon oil **They suggest Canola, I used Olive. I’m a rebel. 4 oz. Sharp Cheddar Cheese, shredded (1 cup) **I used one flecked with bits of Peppadew Peppers. 1/2 cup Low-Fat Sour Cream, room temp **I only had regular on hand. 1/4 cup Skim Milk **I had Whole on hand. 1 – Oven to 400ºF. Rub potatoes with oil and lay directly on oven rack. Bake until skins are crisp and deep brown and skiver glides easily through the flesh, about 1 hour, flipping them over halfway through baking. 2- Meanwhile, melt butter in 10″ nonstick skillet over medium heat. Add onion and cook until softened and lightly browned, 5 to 7 minutes. Stir in garlic and cook until fragrant, about 30 seconds; transfer to bowl and cover. 3- Line rimmed baking sheet with foil; top with wire rack. Transfer baked potatoes to rack; let cool slightly, about 10 minutes. Increase oven temp to 500ºF. 4- Cut each potato in half lengthwise, through narrow side, so that halved potatoes lie flat. Carefully scoop flesh from each potato half into medium bowl, leaving 1/8″ thickness of flesh in each shell. Mash potato flesh with potato masher or fork until smooth, then stir in 1/2 cup cheddar, sour cream, milk, mustard, cooked onion mixture, 3/4 teaspoon salt and 1/8 teaspoon pepper. Spoon mixture into potato shells, mounding it slightly at center. Sprinkle remaining 1/2 cup cheddar. 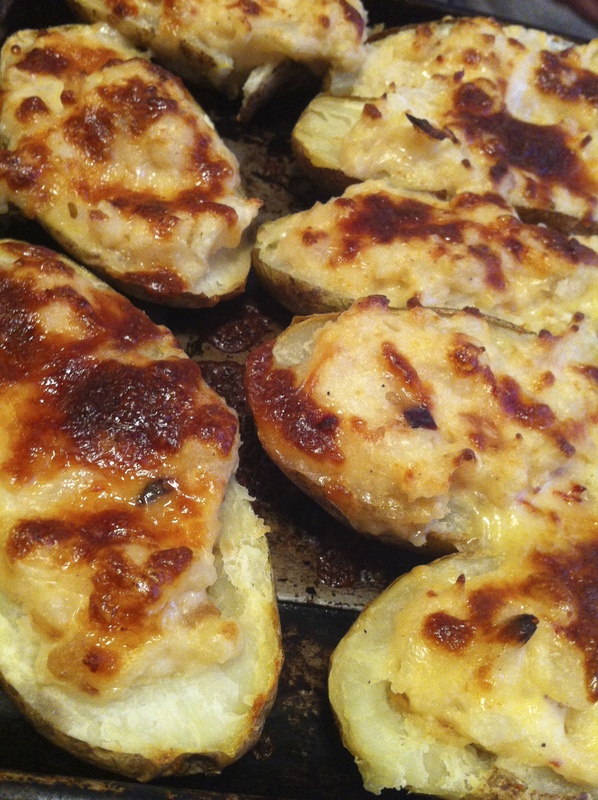 5- Bake potatoes on middle rack until shells are crisp and cheese is melted and spotty brown, 10-15 minutes. Sprinkle with scallions and serve. End Result of THIS meal? C looked me in the eye and told me how much he enjoyed this meal. And then he made sure there’d be enough leftovers for his lunch too. I think J and I applauded. Roasted broccoli is the only way to go. I completely agree that roasted makes everything taste better.